The creature depicted above is called a Lumholtz’s tree kangaroo. It is found only in Queensland’s Atherton Tableland, which is part of the Great Dividing Range. Carl Lumholtz, a Norwegian explorer, actually hunted this species with some indigenous Australians, which he documents in his Among Cannibals (1889), an ethnography of the indigenous people of northern Australia, which he visited in the early 1880’s. 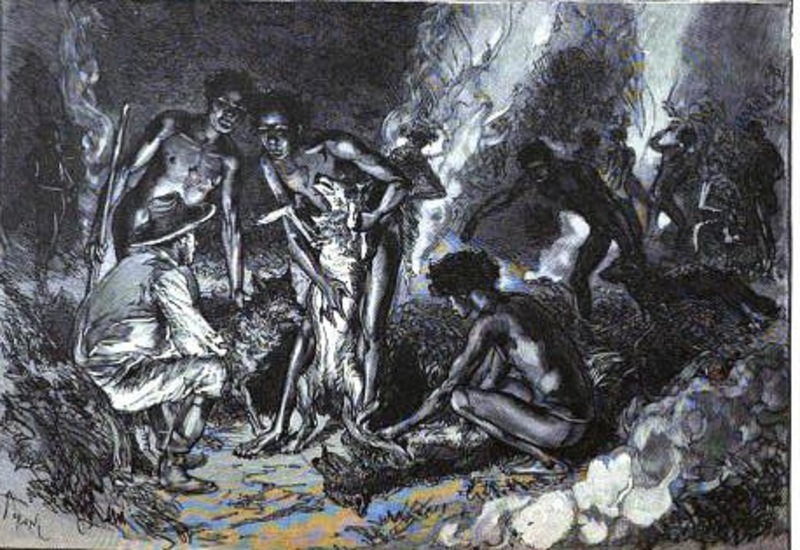 The title is a little bit bombastic, for Lumholtz himself believed that there were many instances of cannibalism among the indigenous Australia. The truth is the peoples of Queensland were not cannibals. Night was approaching, the sun was already setting behind the horizon, the air was very hot and oppressive, and it was evident that there would soon be a thunderstorm. The blacks sat at home in their huts or sauntered lazily from place to place, waiting until it became cool enough for the dance to begin. I had just eaten my dinner, and was enjoying the shade in my hut, while my men were lying round about smoking their pipes, when there was suddenly heard a shout from the camp of the natives. My companions rose, turned their faces toward the mountain, and shouted, “Boongary, boongary!” A few black men were seen coming out of the woods and down the green slope as fast as their legs could carry them. One of them had a large dark animal on his back. Was it truly a boongary? I soon caught sight of the dog “Balnglan” [a socialized camp dingo] running in advance and followed by Nilgora, a tall powerful man. The dark animal was thrown on the ground at my feet, but none of the blacks spoke a word. They simply stood waiting for presents from me. At last, then, I had a boongary, which I had been seeking so long. It is not necessary to describe my joy at having this animal, hitherto a stranger to science, at my feet. Of course I did not forget the natives who had brought me so great a prize. To Nilgora I gave a shirt, to the man who had carried the boongary, a handkerchief, and to all, food. Nor did I omit to distribute tobacco. I at once began to skin the animal, but first I had to loosen the withies with which its legs had been tied for the men to carry it. The ends of these withies or bands rested against the man’s forehead, while the animal hung down his back, so that, as is customary among the Australians, the whole weight rested on his head. I at once saw that it was a tree-kangaroo (Dendrolagus). It was very large, but still I had expected to find a larger animal, for according to the statements of the natives, a fullgrown specimen was larger than a wallaby—that is to say, about the size of a sheep. This one proved to be a young male. 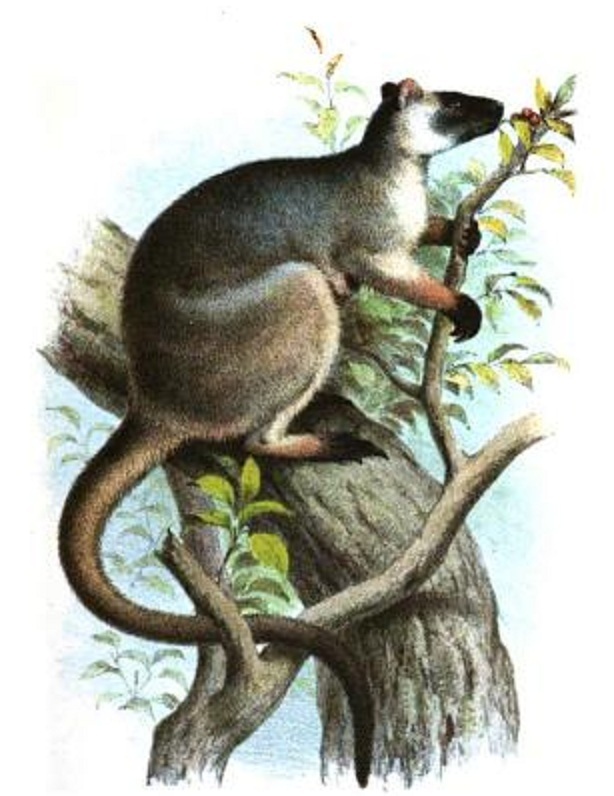 The tree-kangaroo is without comparison a better proportioned animal than the common kangaroo. The fore-feet, which are nearly as perfectly developed as the hind-feet, have large crooked claws, while the hind-feet are somewhat like those of a kangaroo, though not so powerful. The sole of the foot is somewhat broader and more elastic, on account of a thick layer of fat under the skin. In soft ground its footprints are very similar to those of a child. The ears are small and erect, and the tail is as long as the body of the animal. The skin is tough, and the fur is very strong and beautiful. The colour of the male is a yellowish-brown, that of the female and of the young is grayish, but the head, the feet, and the under side of the tail are black. Thus it will be seen that this tree-kangaroo is more variegated in colour than those species which are found in New Guinea. Upon the whole, the boongary is the most beautiful mammal I have seen in Australia. It is a marsupial, and goes out only in the night. During the day it sleeps in the trees, and feeds on the leaves. It is able to jump down from a great height and can run fast on the ground. So far as my observation goes, it seems to live exclusively in one very lofty kind of tree, which is very common on the Coast Mountains, but of which I do not know the name. During rainy weather the boongary prefers the young low trees, and always frequents the most rocky and inaccessible localities. It always stays near the summit of the mountains, and frequently far from water, and hence the natives assured me that it never went down to drink. During the hot season it is much bothered with flies, and then, in accordance with statements made to me by the savages, it is discovered by the sound of the blow by which it kills the fly. In the night, they say, the boongary can be heard walking in the trees (pg. 225-227). Lumholtz would skin the boongary and treated the skin with arsenic. This specimen had to be taken back to Norway and documented. However, the natives would never hunt a boongary without the assistance of a dog or two. The dogs that they had at their disposal were dingoes. The wild dingoes would whelp their puppies in hollow logs, and the hunters would steal them. They would then raise them up in the camps and take them hunting. Not all indigenous Australians hunted with dingoes, but this particular group of people in Queensland did. They carefully trained their dogs to follow scents and trails. The dogs were so useful in hunting tree kangaroos that they never hunted boongary without them. Unfortunately, the dingoes often bolted when the mating season came, and it was very hard to breed them in the camps. So they were always forced to take puppies from dens. I at once called the blacks, among whom the news spread like wild-fire, and after looking for a short time one of them came running with a torn skin, which he had found outside the camp. The whole head, a part of the tail and legs, were eaten. It was my poor boongary skin that one of the dingoes had stolen and abused in this manner. I had no better place to put it, so I laid it back again in the same part of the roof, and then, sad and dejected in spirits, I sauntered down to the natives again. Here every one tried to convince me that it was not his dog that was the culprit. All the dogs were produced, and each owner kept striking his dog’s belly to show that it was empty, in his eagerness to prove its innocence. Finally a half-grown cur was produced. The owner laid it on its back, seized it by the belly once or twice, and exclaimed, Ammery, ammery!—that is, Hungry, hungry! But his abuse of the dog soon acted as an emetic, and presently a mass of skin-rags was strewed on the ground in front of it. My first impulse was to gather them up, but they were chewed so fine that they were useless. As the skin had been thoroughly prepared with arsenic, it was of importance to me to save the life of the dog, otherwise I would never again be able to borrow another. Besides, I had a rare opportunity of increasing the respect of the natives for me. I told them that the dog had eaten kdla—that is, wrath—as they called poison, and as my men had gradually learned to look at it with great awe, it would elevate me in their eyes if I could save the life of the dog. I made haste to mix tobacco and water. This I poured into the dog, and thus caused it to vomit up the remainder of the poisoned skin. The life of the dog was saved, and all joined in the loudest praises of what I had done. They promised me the loan of “Balnglan” again, and thus I had hopes of securing another boongary; of course they added as a condition that I must give them a lot of tobacco. The next morning early I persuaded them to get ready for the chase, but they did not want me to go with them, as the dog was afraid of the white man (pg. 229-230). Which dingo stole Lumholtz's boongary skin? Lumholtz brought with him a Gordon setter, which also had his share of adventures in Queensland. The one I have written about most recently is the dog coming across a red-bellied black snake. However, the dog was of no use running through the forests of the table land after boongary. They needed a lighter-built dog that could run in the heavy undergrowth. The chase begins early in the morning, while the scent of the boongary’s footprints is still fresh on the ground. The dog takes his time, stops now and then, and examines the ground carefully with his nose. Its master keeps continually urging it on, and addresses it in the following manner: Tshe’—tshe’—gangary pul—pulka-—tshe’, pul— tshiuscherri dundun—mormango—tshe’, pul—pulka! etc.— that is, Tshe1-—tshe’—tshe’, smell boongary—smell him— tshe’, smell—seize him by the legs—smart fellow—tslu’, smell—smell him, etc. If the dog finds the scent, it will pursue it to the tree which the animal has climbed. Then some of the natives climb the surrounding trees to keep it from escaping, while another person, armed with a stick, ascends the tree where the animal is. He either seizes the animal by the tail and crushes its head with the stick, or he compels it to jump down, where the dingo stands ready to kill it (pg. 231-232). The indigenous Australians that Lumholtz was writing about lived very similarly to the way all humans did before the advent of agricultural societies. The dingoes in Australia were likely very similar to the wolves that ranged all across Eurasia, North America, and yes, parts of Africa. The wolf that exists today has been heavily persecuted, and I don’t think anyone has taken account of what that persecution has done to wolf behavior– both learned and inherited. I think the original wolves before the persecution were more or less like these dingoes that were used to hunt tree kangaroos. They bred in the wild but were easily tamed– perhaps even as adults. Eventually, whole populations of these wolves existed in hunter-gather camps– and unlike some of these dingoes– they didn’t bolt for the bush when mating season came. A population of wolves that lived in ancient hunter-gatherer camps is the basis for the dog. Whether these wolves were used for hunting can only be conjectured, but it seems to me that they were. A wolf with the basic temperament of a dingo could be used very effectively in the hunt. Modern wolves aren’t normally used as hunting dogs, but within relatively recent history, wolves were crossed into Scandinavian hunting spitz breeds. The Mongolians use dogs that are half wolf and half dog to pursue wolves, and it is well-established that various Native Americans–particularly on the Great Plains– allowed their dogs to crossbreed with wolves, even encouraging wolves to live their camps and mingle with their dogs. The notion that there is a clear dividing line between dog and wolf is simply not correct. There are characteristics of dogs and characteristics of wolves, but there are doggish wolves, like Wags, who belonged to Adolph Murie and was basically a golden retriever that looked like an Alaskan wolf, and wolfish dogs, like many chow chows, which Konrad Lorenz believed were definitely derived from wolves, while most Western dogs were derived from golden jackals. The animals are theme and variation on the same basic species. The idea that hunter-gatherer man would not have used wolves to hunt prey is a notion that I find just a little bit hard to believe. We don’t have hard evidence of it, but when we have these hunter-gatherer people using very truly feral dogs and even other species of wild dog to hunt, I think we can make the assumption that hunter-gatherer man did use the wolf to hunt. He might not be able to do so now, because the wolf is fundamentally changed from what it once was. Wolves today are so nervous and reactive that they won’t cross highways. How exactly could a creature that nervous and reactive colonized that much territory and hunted such a wide array of species? Making conclusions about dogs and wolves using modern wolves is really not all that useful. Domesticating wolves had to have been a really easy affair. It had to have been so easy a caveman could do it. I think these nineteenth century indigenous Australians, who used wild-born dingoes to hunt tree kangaroos and other game, do provide us with a possible clue on how the process could have been started. Exactly. One hasn’t seen any serious attempt to repeat the Russian fox experiment with wolves nor to try to see if wolves isolated (as with Isle Royal wolves) could be tamed and domesticated once selection for “be afraid of people” was removed from the equasion. So often there have been assertions in the past about what dogs (or wolves) were, what they could or could not do, that have been proven incorrect (color vision, ability to reason, etc) — for all our having them for so very very long, we really know less about dogs than we do about some other animals.